It’s not just document management. It’s behind-the-scene empowerment. No matter its source. No matter where it’s going. No matter what you need or want it to do. UnForm will find, enhance and deliver your information with speed and precision. Read our case studies and see how UnForm has solved real business problems for our clients. Track your customer’s activity from PO to Picking Ticket, to signed proof of delivery and invoice. Quickly access documents from the secure archive using UnForm’s intuitive browser-based interface, or via powerful REST and API’s for application integration. Easy access to document type listing for invoices, to view invoice thumbnails for signed proof of delivery image or any other document. Instantly email, fax or print from anywhere. 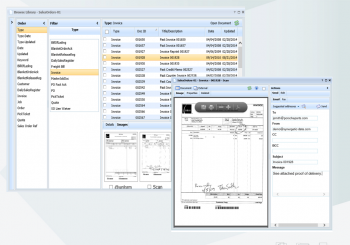 UnForm gives you complete control of your sales and order processes by linking all supporting documents. Easily view all related documents for a specific customer order number by just entering the number or searching for the specific order. 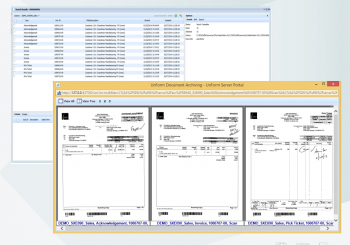 Linked documents can also be quickly accessed via hyperlinks on an invoice or other documents. All the information is there, searchable and actionable. When you are short on time, you need information fast. UnForm includes powerful search capabilities by customer or indexed keywords for document retrieval and viewing. 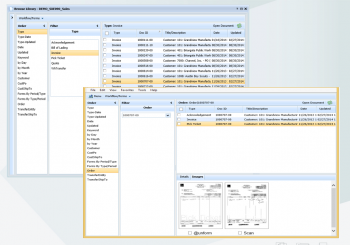 Select any number of documents for instant multi-view display. Quickly choose requested documents and email or fax the documents to your customer.